Yes, it's another tough day at the office. A good friend graciously invites me to spend a glorious spring day with her at the French Open, so I wouldn't want to be rude and refuse or anything. 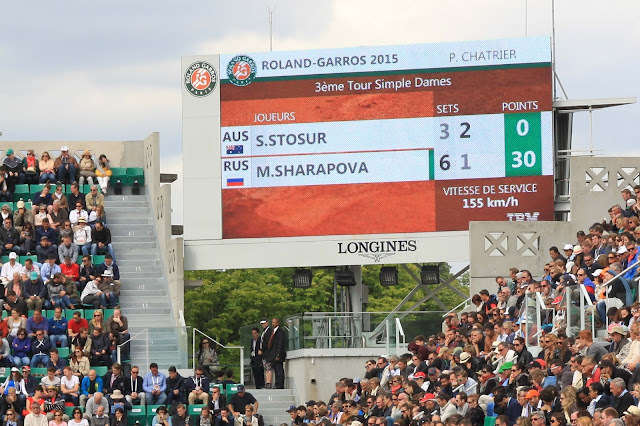 It's noble of me to spend a day at famed Roland Garros stadium to watch the French Open. I know, because as we take our seats, the usher fervently wishes us "a good match", as if it was all going to be such hard work. Needless to say, it is not hard work. We are there on a day with a couple big names, and some French players, not necessarily one and the same, even here in France. The most fun match is the one we almost brush off: the first one of the day, a women's singles between Croatian Mirjana Lucic-Baroni and Frenchwoman Alizé Cornet. The women are just fighting so hard for every point, and you can see the moments when they each crack under the pressure, then bolster themselves back up. Towards the end, the crowd gets louder and louder, cheering on Cornet. She ultimately wins and advances to the 1/8 final, and it's a really sweet moment there with the home crowd so happy for her. In an unfortunate linguistic coincidence, the way they write "Women's Singles" is "Simple Dames", an innocuous phrase that unfortunately looks misogynistic to the Anglophones. If you are imagining lovely French food for lunch, you clearly have not spent a lot of time in France. I come prepared with a picnic of fresh fruits and vegetables, because I am pretty sure any lunch we purchase there will involve bread, ham, and cheese. In fact, I do choose the ham and cheese sandwich (no lettuce, no tomato, not even dressing -- literally just bread with ham and cheese that I have to mustard up myself), but only because it seems a world better than the hot dog. My friend says that at Wimbledon, they serve bowls of strawberries with large vats of help-yourself cream. Don't go to Roland Garros expecting this level of cuteness. Evidently, the French save the cuteness for horse-racing, or at least for horse-racing ads. Oh, who am I kidding? Even if they wear fancy hats, the snack bar at the Hippodrome de Chantilly will still be serving plain ham and cheese on a baguette. After our bready picnic, we see Roger Federer play, wiping the court with Damir Dzumhur, whose nationality is listed as "BIH". We spend a while guessing: Bahrain? Bahamas? Silly us. It's Bosnia and Herzegovina. It seems like Federer barely breaks a sweat. Sharapava, who also wins her match handily, is in a sylish marinière striped shirt, which earns her immediate brownie points with the French. When she comments that she chose it as a nod to Jean-Paul Gaultier, the audience is completely won over. The other stylish thing about the French Open is that each section seems to have its own straw hat brim color. We are not given straw hats, so we have to assume it's some form of corporate swag. There's an Orange Section, the Red-banders, the Greenies, etc. We seem to be behind the Navy Blue Set. We stay just long enough to watch a little of Frenchman Jo-Wilfried Tsonga start his match against Spaniard Pablo Andujar (Tsonga ultimately won), but by then we really are getting fatigued from our very strenuous day of a lot of sitting and watching tennis. We are also slightly sunburned, despite being in the shade (reflection, perhaps? ), though we won't realize this till later. French Open time does not elicit the same level of enthusiasm as the World Cup (especially when the French are in it), but there's definitely a special, sporty something in the air. The French Prime Minister himself has just announced that the Roland Garros stadium will be enlarged, encroaching upon surrounding park lands, including the demolition of lovely, historically protected botanical gardens. Needless to say, many people who actually like historically protected botanical gardens and lovely parks are not pleased. And, while we're at it, you should know that Roland Garros was not a famous tennis player. For all I know, he never picked up a racket in his life. In fact, he's a World War I French flying ace hero, who helped develop the technology for timing the shooting of machine guns through rotating propellers and was ultimately shot down and killed by the Germans. The finals are coming up this weekend. Who will win? Me. Because I got to spend a wonderful day at the French Open with my friend. Actually, I come in second, and my friend wins, because she is spending four days at the Open. She'll even be there for the final, working hard to warm her Roland Garros seats till the bitter end. And speaking of the bitter end, this cheese has a bit of a bitter end to it, too. Well, more putridly stinky than bitter, I suppose. Tomme Cabrioulet (labeled Tomme Chèvre Cabrioulet when I buy it) is a raw goats' milk cheese. It was created in 1983 by a farmer named Philippe Garros, who wanted to create a goats' milk cheese at his farm in the Pyrénées that was original. This one is, especially with its beautiful red clay-colored crust, flecked with black mold. It's really a dirty, earthy looking cheese, with a flavor to match -- farmy, earthy, with a pungent acidic goat tang. The texture is lovely -- a sort of creamy/rubbery that melts in the mouth. Yes, even the crust is edible, and while it doesn't change the flavor much, it adds something toothsome and just a little chewy. Basically, the color on the crust of the Tomme Cabrioulet is almost exactly the color of the clay courts at Roland Garros. But I wouldn't try to bounce a ball off it. In one of those crazy coincidences that I seem to run across frequently in my cheese blog (and my life), the Tomme Cabrioulet was invented, in 1983, by somebody named Garros (Philippe Garros). Coincidence? Or fate? Perhaps it was simply that cheese was destined to be linked to the French Open. I just wish I could have had some of it on my French Open sandwich to add some zip.